Yam, Any informatioon as when we are going to have didar at Nairobi. Some sources says it will be in July 2011 but not sure. as i want to call my family and make arrangements. please inform. is the Didar only for Nairobi Jamat and international jamats? is it possible that Hazar Imam is giving Didar to 3 East African countries and he has not sent any Talika? On the main page it shows that there are 3 didars in Nairobi. Is one of the dates for the international jamats?? When do we register for the international jamat? Interesting! Where will he be on the 9th/10th/11th? Very unlikely to fly back to France. There are lots of official work in Uganda and Kenya. Kenya: possible Heart & Cancer Center, AKDN building is also ready for opening, Maybe foundation of AKU Media faculty. Who knows, foundation for a Park similar to Cairo? Some work in Mombasa. Possibly Kisumu? So all empty days will be taken in official events. The question is where will the Imam celebrate 11 July? Can you clarify what you mean by "local Jamat" and what you mean by "for all". "Local Jamat", residents attending all works such as mehmani, mahadan etc... where only residents will be allowed. This will be conducted inside the Jamatkhana, not in the large facility arranged outside JK. "For all" means general didar where everyone can attend including international Jamat.. 23rd may be a Darbar. There will be also a day "for all" in Dar es salaam and in Kampala but not in Mombasa. Does USA residence needs to obtain Visa? to visit East African Countries where didars are schedule of MHI? I know,that it is not my business to tell you smth..but i will kindly ask all of you not to MAM and YAM and MHI here ok???please. Mavlana Hazir Imam not MHI...it's wrong!!! it is totally wrong! Mubaraki to All Ismaili Jamat world wide,Any news that outside jamat is allow for darbar in nairobi, if yes how to register for the pass, any idea? I agree with Aramein, we all ( including my self) should write in full forms instead of short forms. it save little time in writing but not much other hand it shows big respect to our Mowlana Hazar Imam (s.a.) and Hazarat Ali (s.a.). > Hazar Imam's programme during his visit in East Africa. Following the happy news conveyed to the Jamat yesterday regarding Mawlana Hazar Imam’s visit to Kenya in July 2011 to undertake Jamati work, the National Council, ITREB and Huzur Department take this opportunity to inform the Jamat of the envisaged ceremonies and their format, which Mawlana Hazar Imam has approved. Mawlana Hazar Imam has desired that the Jamat should be made aware that his forthcoming Jamati visit initiates a new cycle of Jamati work, in which the number and format of ceremonies will be adjusted to reflect changes in the Jamat’s circumstances, including its demography, as compared to the earlier cycle of visits. Mawlana Hazar Imam wishes it to be emphasised that the changes that he has approved do not in any way compromise the essence and meaning of each ceremony. Mawlana Hazar Imam has also desired that, in as far as possible, all the ceremonies should be undertaken in Jamatkhana spaces. Eligibility criteria: All bona fide residents of Kenya, Rwanda, Burundi and South Africa will be eligible to participate in the Jamati work. In addition to in-country national citizens, this will include other long term residents holding work or residency permits. Students pursuing study courses abroad will be eligible. However, national citizens who may have formally migrated to alternative countries will not be eligible. Family Mehmani: During the forthcoming visit, and in conformity with age-old Jamati tradition, Mawlana Hazar Imam will accept family mehmanis from those who wish to make this submission. The format of this ceremony will be adjusted, whereby mehmani submission occurs in affinity Jamati groups, representing individual Jamatkhanas or similar groupings. Each family that has registered to submit a mehmani will be requested to be present during a specified session in a Jamatkhana space, where Mawlana Hazar Imamwill accept the mehmani of all the gathered families by way of a symbolic submission made by the relevant Jamati Mukhi-Kamadia and Mukhiani-Kamadiani. A family will be defined as a unit sharing a single household. In situations of joint families sharing a single household, each unit may be considered as a separate family. General Deedar: At his entire pleasure, Mawlana Hazar Imam will consider granting a deedar to a general Jamati gathering at the conclusion of his visit. The foregoing is an overview of the ceremonies for the Jamat’s initial information, and further details will be conveyed by the National Council, the ITREB and the Huzur Department. The Jamati leadership respectfully requests the patience and understanding of Jamati members in the preparatory processes leading to Mawlana Hazar Imam’s presence among us to undertake the ceremonies. The registration procedure for participating in the various ceremonies will commence on Thursday 23rd June 2011. The Jamat is requested to participate in this process promptly, thus allowing for its urgent completion. The Jamat is also respectfully requested to extend its full co-operation and support in this matter, and to comply with any reasonable request for proof of identity or residence, and similar. In the light of current global circumstances, the Jamat will no doubt appreciate the importance of maintaining vigilance in these matters. Closer to the time of Mawlana Hazar Imam’s visit, the institutions will undertake the distribution of entry cards, alongside other details to facilitate the Jamat’s dignified participation in the ceremonies. From the announcement of the National Council there is no indication that outside Jamats will be allowed, indeed the general deedar for all will only take place subject to Mowlana Hazar Imam's pleasure - it is not definitely confirmed yet. Is Mahdan Chanta and Mehmani arranged for all the places of Didar in E. Africa? What is the registration process for international jamat for Mahdan Chanta and Mehmani? Hi Everyone, There is so much excitement happening on this side of the world with the announcement of Hazar Imam's visit that I thought I would try and share with you any and every detail I can. As you know, an LIF announcement was made last Friday indicating that Hazar Imam will be coming to East Africa during the month of July. We all anticipated his visit to Nairobi to open up the new Heart & Cancer Centre and AKU School for Media and Communications, and there were rumors about a possible deedar...but the announcing of jamati ceremonies (Mehmani, Bol ceremony both new and promotion, Last Rights Chantaa), that was what brought on all the 'oohing' and 'ahhing' in khane. Friday night was an explosion of mubarakis, sherbat and cake. Saturday night went a step further with dandia raas and biriyani. The dates for Dar es Salaam have been confirmed for July 5-8th and Nairobi will be from the 14-16 and 23. The other East African country dates have not been announced yet. Hajri in khane has increased dramatically, and yesterday we began standing up shukran tasbih and salwaat. There was also a waez made by Shafin Virani on preparing for the visit, specifically the meaning of each of the jamati ceremonies. Some key things to note are: individual and family mehmani will be done symbolically by the Mukhisaheb instead of having each family member go up to Hazar Imam; the minimum age for Last Rights Chantaa has been increased from 50 years (the last time this ceremony was performed) to 55 years of age, which Shafin Virani said is a tangible indication of the increased longevity that Hazar Imam always talks about. Every one was asking for change and Mowlana Hazar Imam graciously made some changes in Mehmani ceremony. At least now no body will misrepresent what happened in Mehmani. The above change is necessary looking the large number of Jamats and it is time saving change and it is necessary at this time. But what about the BOL? Bol can not be given to Mukhisaheb, it is between Murid and Murshid and it is totally different then mehmani. Who has suggested or where is it mentioned that the procedure of granting the Bol has changed? Posted: Wed Jun 22, 2011 11:20 pm Post subject: Can Mukhi Saheb take 'BOL" for entire jamats? Please visit "doctrines "section for this question. I am very happy that the African Jamat will receive a Didar from Hazar Imam. Mubaraki. I do not live in Africa but the announcement of a Didar anywhere in the world is a joyous moment for every murid. The only hope for showing great love and enthusiasm and happiness over Mowla's forthcoming visit to East Africa now rests with the Tanzanian jamat. In the Golden Jubilee, they outdid themselves with their welcome to the Imam, decorating the streets of Dar Es Salaam and looking after the jamat extremely well. It is no wonder then that they have carried away the Honour of being the first jamat to be blessed with Kamkaaj and Deedar, after the Golden Jubilee. I hope and pray this time too they will give the Imam the grandest of welcomes and allow the jamat to gather at the airport once again and line the streets, welcoming their Beloved to their city. I also hope that Tanzanian jamat will ask our beloved Imam to cut a cake for Imamath Day. As I have said, this can only be done now by the Tanzanian jamat. Early indications from Nairobi already show the reverse. Flowers are not going to be put on the stage, jamati dinners and lunches have been severely slashed and the only talk that can be heard is "times are tough and so we should cut down." Nairobi has forgotten its days of glory when Zeenat Popat used to make huge, beautiful cakes and the Imam used to be so so happy and insist that the cake be shared out with the jamat. We have become too snobbish now - making the Imam cut a cake seems to be beneath us. No wonder then, after the Darbar in Dubai on 13th December 2003 (when no cake was cut), our beloved Imam has avoided being with the jamat on 21st March, 11th July and 13th December. Think about it. 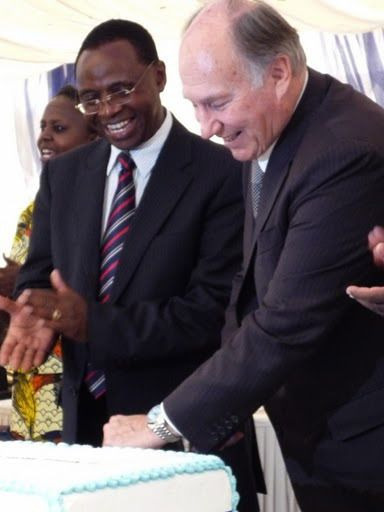 In 2005, deedar in Nairobi was scheduled on 22nd March even though Mowla was in the country on the 21st March; in 2008, Darbar in Lisbon took place on 13th July although the Imam was in Lisbon on 11th July; the finale Darbar of the golden jubilee in Paris took place on 11th December and not 13th December (shamefully, during this Darbar, no cake was cut for His birthday and no gift presented to Him for His birthday); this time too, Mowla is in East Africa but no mulaqat has been scheduled for 11th July. This is indeed very heartbreaking and therefore I would appeal to the Tanzanian jamat to keep the flag flying high, receive the Imam with grandeur and have a cake cut during the Darbar on the 8th. Let us prove to our Imam that we still love Him. There is no point making such appeals to the Nairobi and Ugandan jamat because they just don't listen! Let them not keep flowers on the stage, let them save costs by not feeding the jamat, and they will see that next time, they will come at the bottom of the visit schedules. This time, Nairobi is already last in East Africa whereas it was always first. An ominous indication that should be taken heed of. Mowla loves flowers, appreciates warm welcomes and loves to see that the jamat has taken the time to come and welcome Him. And He loves cutting cakes and sharing them with the jamat! How happy was He, how radiant was He in March 2010 when He was asked to cut the cake for the Nation Media Group's 50th Anniversary! He even sang Happy Birthday along with the crowd and mashallah, never have I seen such broad smiles on our Imam's holy countenance. How happy was He, how radiant was He when He was admiring the beautiful lighting fixtures and floral arrangements in Singapore in 2008. How happy was He, admiring the beautiful welcome signs and billboards dotting the city of Dhaka in 2008. And here we are, cutting just the things that He admires and loves. Truly this is kaljug. I am so happy to hear that Dar Es Salaam has already had dandia and biryani. Keep it up and kudos to you!! How happy was He, how radiant was He in March 2010 when He was asked to cut the cake for the Nation Media Group's 50th Anniversary! He even sang Happy Birthday along with the crowd and mashallah, never have I seen such broad smiles on our Imam's holy countenance.